In addition to his official title of Señor Brewer, the man who helped 3 Ravens to the Champion Small Australian Brewery title before crossing town to Moon Dog could also be tagged The Recreator. One of Adrian McNulty's last beers at 3 Ravens was his attempt to recreate Pedro Ximenez in beer form (The Druid) and more recently he's looked to recreate champagne as beer with Bad Boy Bubbly. "Basically the idea was to make a beer that mimics my preferred hangover cure/starter, the Bloody Mary. To achieve this, we added 75kg of tomato puree and paste, vegan Worcestershire sauce, shitloads of celery salt and a mixture of pequin, birdseye and chipotle chillis. The idea for the chilli is that it doesn't dominate, but by the time you've finished the bottle/glass there should be a slight warming tingle. Breakfast of Champions is also one of my favourite ways that Wesley Willis signs off his songs." 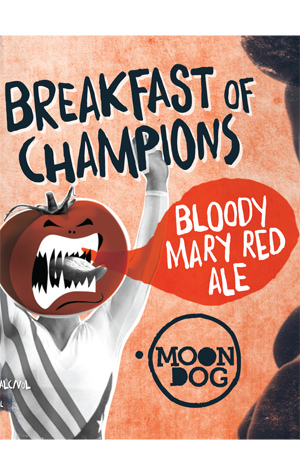 Specialty malts (and tomato) have given the beer a deep red hue, while he says "tomato is the dominant aroma with celery highlights and an umami characteristic." Flavour wise "rich tomato dominates with a solid malt backbone and a mild chilli kick. Northdown hops provide minimal bitterness and a slight spicy/earthy edge. Finishes crisply."